Every so often I have to identify or research some Unicode characters. There's a tool called uni in the Perl 5 distribution App::Uni. 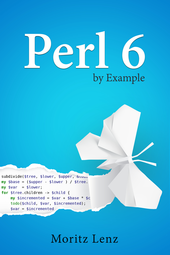 Let's reimplement its basic functionality in a few lines of Perl 6 code and use that as an occasion to talk about Unicode support in Perl 6. Each line corresponds to what Unicode calls a "code point", which is usually a character on its own, but occasionally also something like a U+00300 - COMBINING GRAVE ACCENT, which, combined with a a - U+00061 - LATIN SMALL LETTER A makes the character à. The chr method turns a code point number into the character and ord is the reverse, in other words: from character to code point number. Since all character names are in upper case, the search term is first converted to upper case with $search.=uc, which is short for $search = $search.uc. By default, parameters are read only, which is why its declaration here uses is copy to prevent that. As alluded to above, not all code points are fully-fledged characters on their own. Or put another way, some things that we visually identify as a single character are actually made up of several code points. Unicode calls these sequences of one base character and potentially several combining characters as a grapheme cluster. The Uni type is akin to a string and represents a sequence of codepoints. It is useful in edge cases, but doesn't support the same wealth of operations as Str. The typical way to go from Str to a Uni value is to use one of the NFC, NFD, NFKC, or NFKD methods, which yield a Uni value in the normalization form of the same name. UTF-8 is the default encoding and also the one Perl 6 assumes when reading source files. The result is something that does the Blob role; you can access individual bytes with positional indexing, such as $bytes. The decode method helps you to convert a Blob to a Str. which produces the output -0.5 and also illustrates how to use a codepoint by name inside a string literal. Sorting strings starts to become complicated when you're not limited to ASCII characters. Perl 6's sort method uses the cmp infix operator, which does a pretty standard lexicographic comparison based on the codepoint number. The default sort considers any character with diacritics to be larger than ASCII characters, because that's how they appear in the code point list. On the other hand, collate knows that characters with diacritics belong directly after their base character, which is not perfect in every language, but internally a good compromise. For Latin-based scripts, the primary sorting criteria is alphabetic, the secondary diacritics, and the third is case. $*COLLATION.set(:tertiary(False)) thus makes .collate ignore case, so it doesn't force lower case characters to come before upper case characters anymore. At the time of writing, language specification of collation is not yet implemented. Perl 6 takes languages other than English very seriously, and goes to great lengths to facilitate working with them and the characters they use. This includes basing strings on grapheme clusters rather than code points, support for non-Arabic digits in numbers, and access to large parts of Unicode database through built-in methods.